Sometimes you look at a finished piece of art and wonder just how the artist designed and fabricated the piece. I recently completed this knife and took some sequential photos during its progress. I wrote down a few thoughts about the process and produced an article for the Saskatchewan Craft Council’s website called “The Sum of all Parts” – following is a rendition of that article. 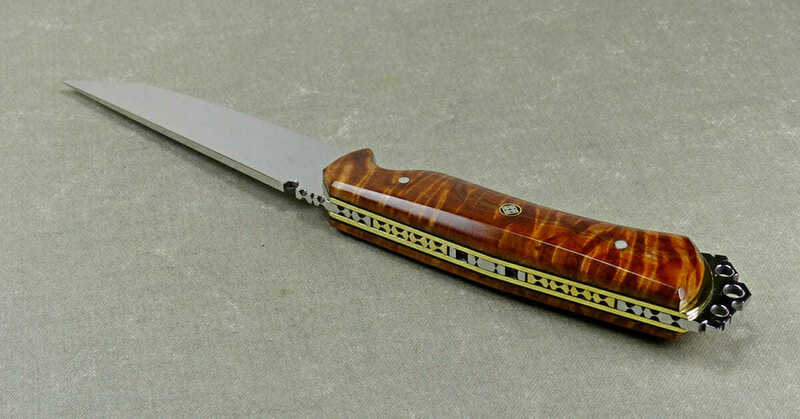 The most difficult part of knifemaking is committing to a final design. In the beginning one has an idea which has to be brought forward into the physical world. It’s easy to draw the design on paper, but because of the limitations of one’s tools and skills, this drawing is not always possible to execute. This is where the challenge comes in. You may have to build a new machine, find new materials, learn a new skill or all of the above. Even then, sometimes you have to go back and modify your original design in order to accommodate all your new ideas. 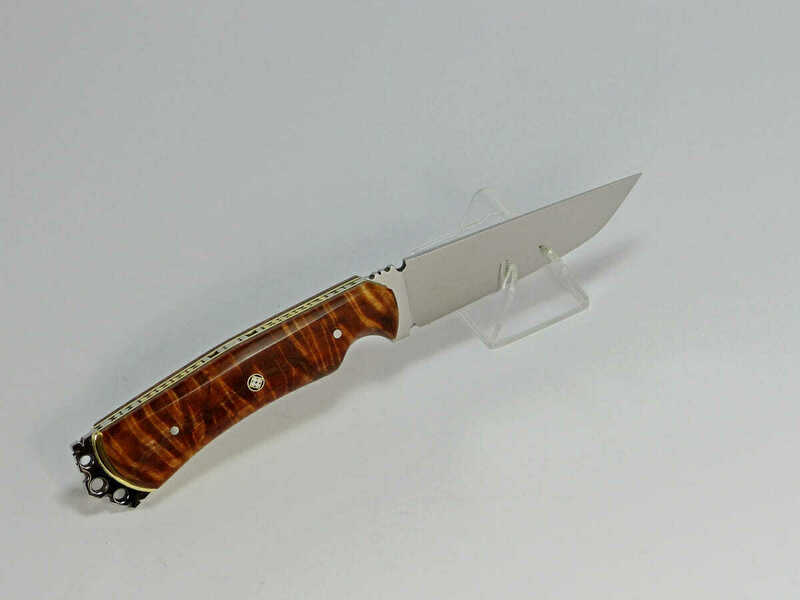 Now that you have decided it is possible to build this knife, you carefully plan all the steps in a rigid order toward the completion of the knife. One major factor in this assembly order is that at some point you have to heat treat the blade. After this step NO alteration of the design can be performed. The blade and tang are fully hardened and no new holes, filework or any other process can be performed. This being said, all the parts and pieces must be carefully crafted and trial fit dozens of times to make sure all the parts are a perfect fit before this hardening process takes place. There’s no going back now and changing something after this step has been taken. After you are sure everything is acceptable (or as close to perfect as any knife maker strives for), you go ahead and harden the blade. The stainless steel has to be taken up to around 2000 degrees Fahrenheit to harden it and when this process is done, the blade is covered in a dark oxide which has to be carefully removed. 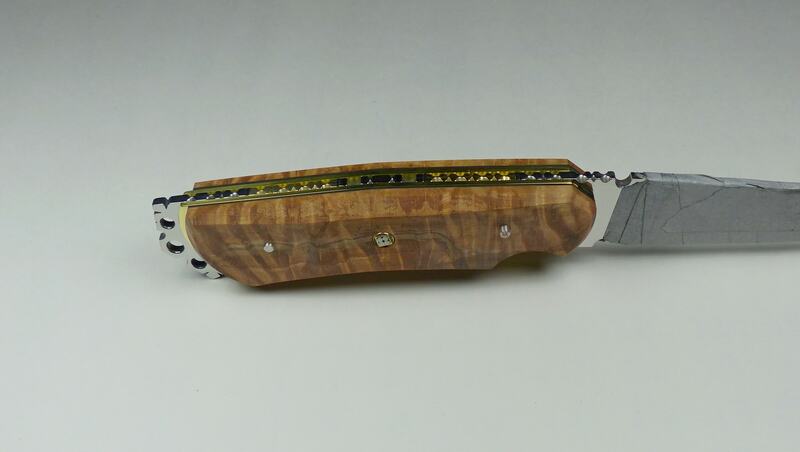 Then the blade has to be mirror polished before the final glue up stage. This glue up step can cause one lots of grief if you haven’t been meticulous in your pre-fitting steps. The next major hurdle is this glue up stage. 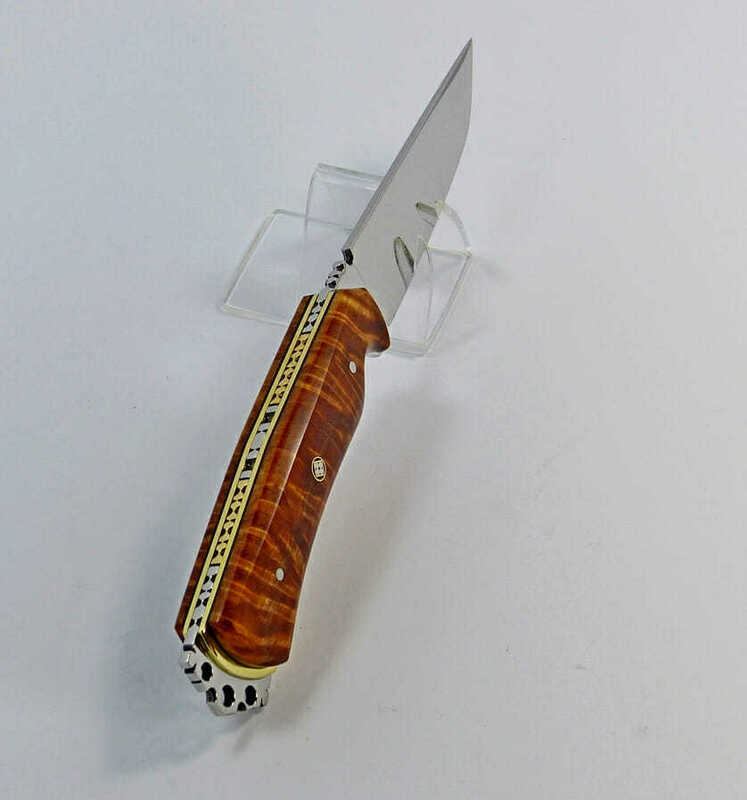 This particular knife has 21 separate pieces and once they are all covered in sticky epoxy, there is no time to alter anything. This two tonne epoxy takes about 24 hours to fully harden and now what you have is just a block of glued together pieces that doesn’t have any shape or form. At this point you’re skills and tools will make the birth of your idea happen. There are many, many stages of this whole procedure where one slip of the hand or a lost moment of concentration can ruin the knife beyond repair. This skill of making your hands and machines do what your brain pictures in your mind is the real talent of being any craftsperson. Through careful thought and manipulation and after sometimes a month of intense labor, your vision becomes a reality. The following photos are mini steps and stages of designing, fabrication and trial fitting of these pieces toward the finished end or the sum of all parts. 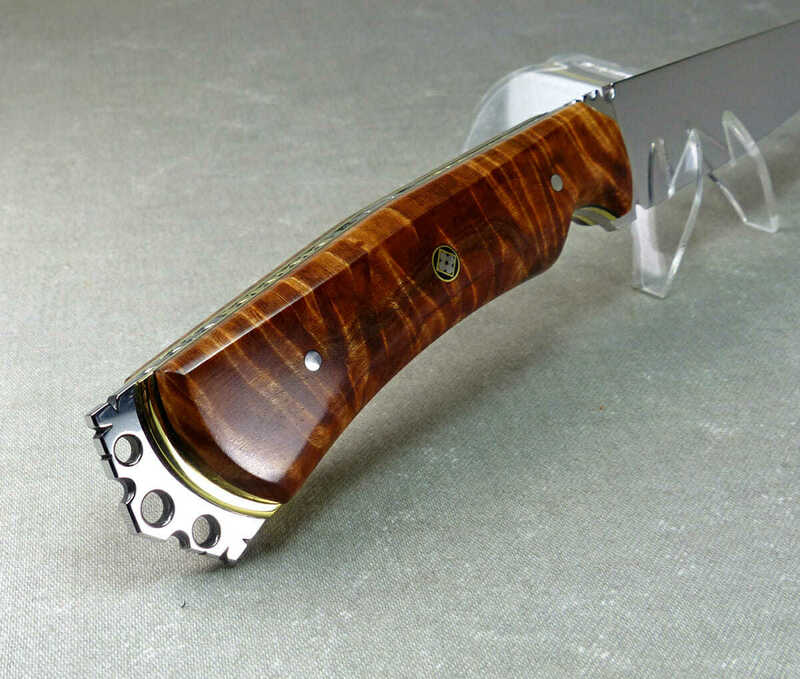 Photos 1 to 4 are in the designing stages of the fancy filework – one of the focal points of this knife. This filework is all done with tiny jeweler’s needle files to a very exacting scale….one slip here and the whole blade spine has to be ground off and redone. Turn off the cell phone and the radio – no distractions at this point! I try to design different filework patterns for each of my knives, although I do have favorites that I do more than once. These patterns are laid out in different colors of felt pen to differentiate the various file types necessary to cut the specific patterns. These designs can be symmetrical or asymmetrical depending on the desired effect. Putting the file handles in golf balls helps your hands immensely when it comes to fatigue and control. This tedious filing can take many hours. Photos 5 and 6 show where I have cut out the tang to allow for the inlaid brass file worked sections. This was my unique twist for this particular knife. Normally a knife maker will just do the file work on the back of the spine itself, but my new technique was to cut out sections inside this file work pattern and insert another pattern made from a different material…..and yes, I do drive myself crazy by doing these types of innovative techniques and constructions! Photos 7 to 9 show some of the different pieces and how they assemble towards the final fitting. The next photos show the pieces against the original scale drawing of my design and how they match up. The next selection show more pre-glue up assembly trial fitting – some of the pieces have been further shaped and contoured which cannot be done after the glue up.